Event An idea is a mental representational image of an object or a thought. It is rightly said that the value of an idea lies in its usage. 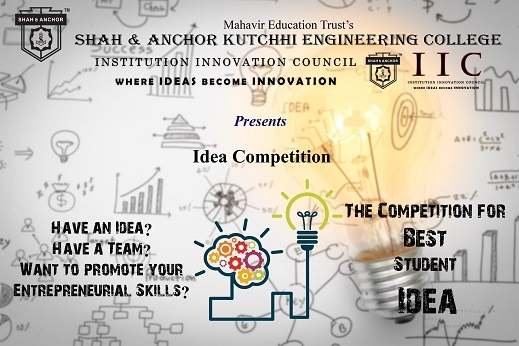 IIC-SAKEC invites innovative ideas of students those who are willing to portray their thoughts and present their ideas. This is the best platform for students having ideas with marketing potentials and social impacts. Ideas can be abstract concepts, opinions or beliefs regardless of them being valid. What’s more important is the capacity to create and understand the meaning of ideas, which is considered to be an essential feature and can be brought about among students flourishing through such competitions. This Idea Competition can be the first step towards turning your Idea into reality. An important thing to note is that students will be evaluated on the basis of novelty, methodology, social impact and marketing potential of their ideas. Teams in each event shall be shortlisted for the final event.